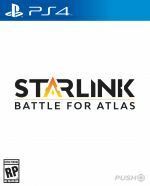 One of Ubisoft's games that's flying a bit under the radar is Starlink: Battle for Atlas, a toys-to-life space shooter. It's not going to blow anyone away, but it's looking to be a decent game aimed at a younger audience. This latest trailer gives us a good look at some of the environments you'll be able to explore and protect from the Forgotten Legion. It looks fairly good, and while the idea of building your own spaceship out of components may get old quickly, there's no denying it's a novel concept, and we're sure kids big and small will get a good kick out of it. Starlink is out on 16th October. It does look nice - pretty basic though. I think there's the option to buy the ships and bits digitally too. Whether that translates to being cheaper than buying the toys I don't know. Has a No Man's Sky look to it which is nice and I know it's aimed at kids (isn't it?) but think I might end up getting it. I still don't quite know what this game is, but i feel like i'd play it.